A lot of people say that the Iraqi Prime-Minister’s visit to Kuwait last week is the real reason behind this sudden Bedoon unrest in Jahra & Sulaibiya. The Iraqi PM had promised to provide Kuwait with all the names & documents of the so called beddoon living in Kuwait. Fearing that they will finally be uncovered as Iraqi citizens, the Bedoon are trying to raise some unrest, as a bargaining way to force our Kuwaiti government into leniency with them. 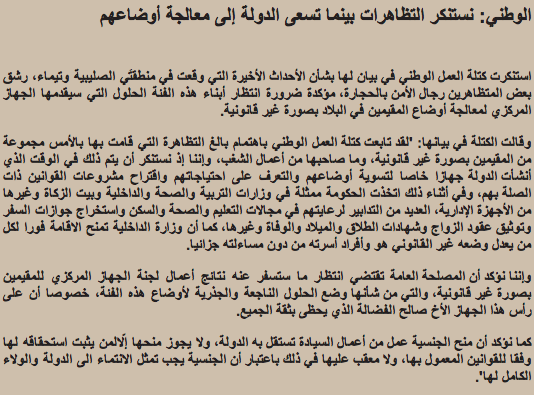 My personal opinion of the matter is best described by the statement of Quwwat Al-3amal Al-Wa6ani, taken from Al-Jareeda. ana ma kint nawya atklam bhal maw’9o3 kilsh bs el-video narfzni ,,,3fwan ay 7qoooq ?? tabon 7qoqkom ro7aw dertkom 5al ya36onkom 7qoqkom el-kuwait mo malzoma fehom mo ehya ely yabt,hom ehma ely yaaw mo 3ajbhom el-wa’93 5al y6l3on lish yaw mn el-asas !! low omhom q8tya aw fehom re7at el-q8tyen ma gelna shy bs kilma q8taya wa7da ma 3arfen ygolon shybon bel jensya el-q8tyaa? o b3den ely yswi 5er ma yan6er el-rad 3shan ytflsfon sawena o sawena shsawaw ehma ma ‘3er 5rbaw edera !! ana m3a el-bedon ely ystahlon ely 9ij 9arlhom snen 3ayshen bel dera o 3ndhom ahal q8tyen o e7trmaw hal ar’9 o esht’3law o klaw mn 5erha bs mo ma3a hal ashkal ely bel video ! hatha jeza el-q8 ga3den ywaklonhom eblash o yd5lonhom mdares mn ero’9a ly el-jam3a eblash a5rt,ha mo’9ahrat o a3mal sh’3ab !!! kilmat 3eeeb shwaya 3lihom ! I wasn’t going to talk either, but changed my mind when I saw the video. And ppl on twitter are already slamming me with being a racist, backward, and other stuff.